When isn’t it a good time to do a makeup haul? Well, I can’t think of a better time than to celebrate my little sister’s February wedding. I’m the Matron of Honor and will be doing her makeup and mine! While my mum was getting her eyes done at the Lancome counter, of course I had to purchase a few items too. What really convinced me to splurge was the gift promotion they were having. If you spent $35, you’d receive a bag filled with makeup goodies that totaled up to about $70! I remember when I was a little girl going to the mall with my mum when she purchased Lancome makeup. As one of their promotions, they would give you a loaf of French bread and a tote bag. Looking back, it seems so strange to give out a loaf of take-home-to-bake bread with purchase, but it solidified the idea that Lancome was a French brand! I stopped writing this post to call my mum and ask her about it. She began laughing as we reminisced. She said that when she’d get her makeup from the booth, we’d always have a meal that went with French bread that evening! How neat! Long gone are the days when you receive a loaf of bread with purchase, but the company always has gift promotions that include makeup bonuses! For the main item, I purchased a primer that I’d been wanting to try for awhile: the LA Base Pro. This primer from Lancome is designed to help your makeup look perfect for photos (and in person). What really sold me on it was the texture. The product feels like silk and isn’t sticky or thick. La Base Pro is supposed to help your makeup look more vibrant while helping it stay put! I especially liked the products ability to diffuse light, reducing lines and imperfections. I have pretty large pores and have tried a lot of different primers. What this product did was smooth my skin and help it look much less oily during the day. Pricey at $42, this is an item I consider a beauty investment. I was pleased with the primer and used it on my sister for her wedding (and on me!) I noticed that her pores looked a lot better when it was applied and that her foundation went on much smoother. It was hard to measure how well it made her makeup last because she usually doesn’t wear foundation. My skin, however, looked really great during the wedding and during photos. I kept some concealer and a beauty blender in my purse and only needed about two touch-ups. I have acne and uneven skin tones. The base really helped create a smooth surface for my blush and bronzer. Since I’ve been wearing LA Base Pro I’ve even gotten a few compliments on my skin. Muahah…if they even knew! Included in the gift was a choice of makeup bag and many other goodies. Here’s a breakdown! I picked out this adorable makeup bag with my gift. There were two others to choose from but I loved the stripes and teal color. It reminded me of Kate Spade. 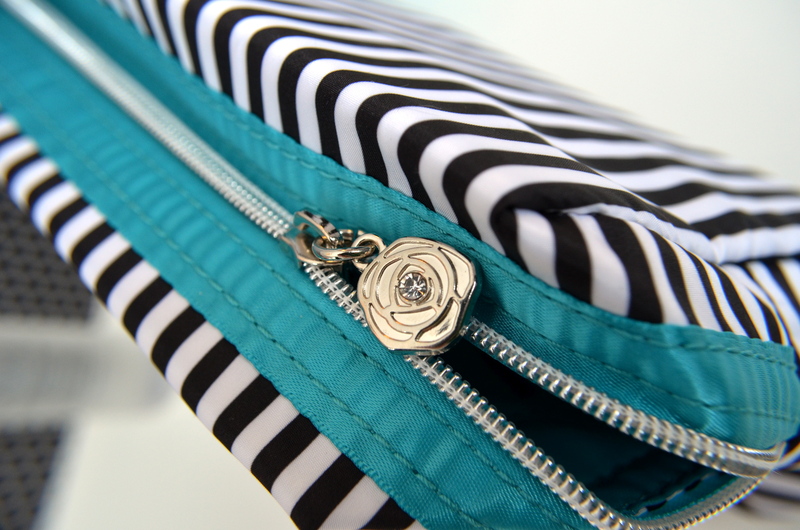 The zipper has a flower with a crystal. Fannncy. I almost purchased a full size of this mascara, but I’ll be honest, I’m waiting for Benefit’s Roller Lash mascara which is coming out at the end of February. I always seem to have trouble with my bottom lashes. Mascara rubs off and gives me raccoon eyes. I told my mum this and she said that she was in love with Definicils and it doesn’t smear. 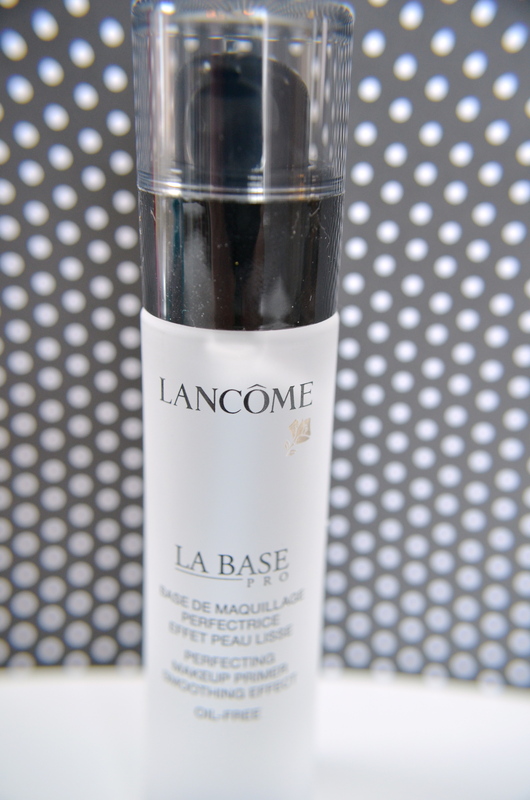 When our friend (a Lancome rep) brought out the primer, I was sold…but I was happy to get a sample of this in my gift. Mum was right: the product stays on and doesn’t rub. I’m impressed. 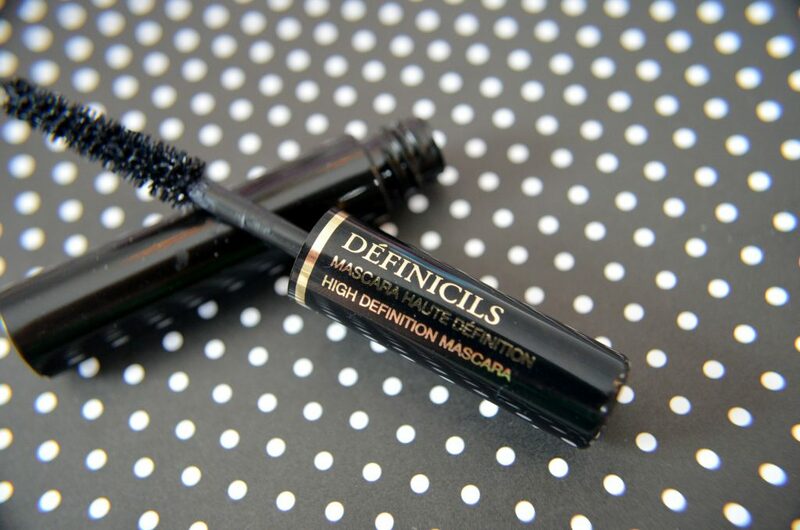 I like this better for my lower lashes than my holy grail mascara: Benefit’s They’re Real. Mixing both products seemed to give off the best results. Definicils on my bottom and Benefit’s on the top. Although mum said she liked Definicils, a few friends talked her into trying the newest mascara from Lancome: Grandoise. I tried hers and liked it. 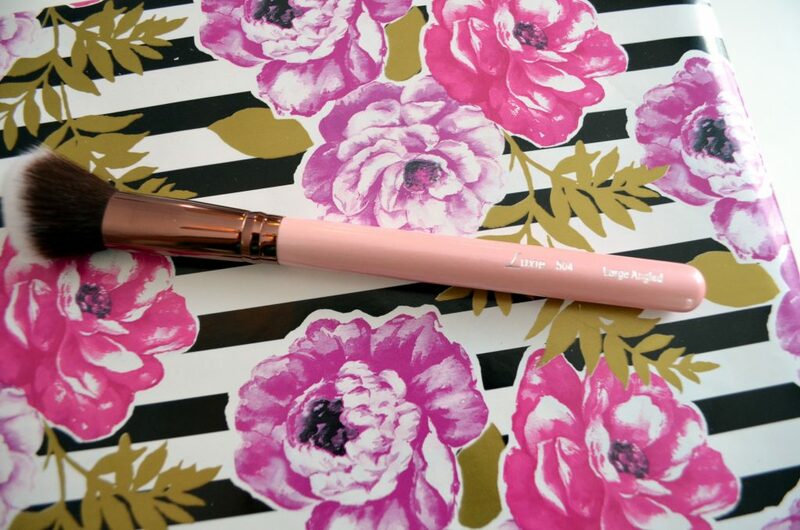 The curved “swan neck” applicator helps you get every individual lash. This product is a holy grail for many makeup addicts! I’ve never purchased a full size because I always get them free in bonus gifts. Right before my sisters’ wedding, I used this to clean my beauty blender. Let me tell you, it worked phenomenal. The makeup that had been inside the sponge grossed me out. I kept pouring the makeup remover on the sponge and running it under hot water until it looked like new! I haven’t yet had a chance to use the makeup remover on my face, but if it works half as good as it did on the makeup sponge, I’ll be impressed. I always get excited about lipsticks and other items in my gift but this was a pleasant surprise. 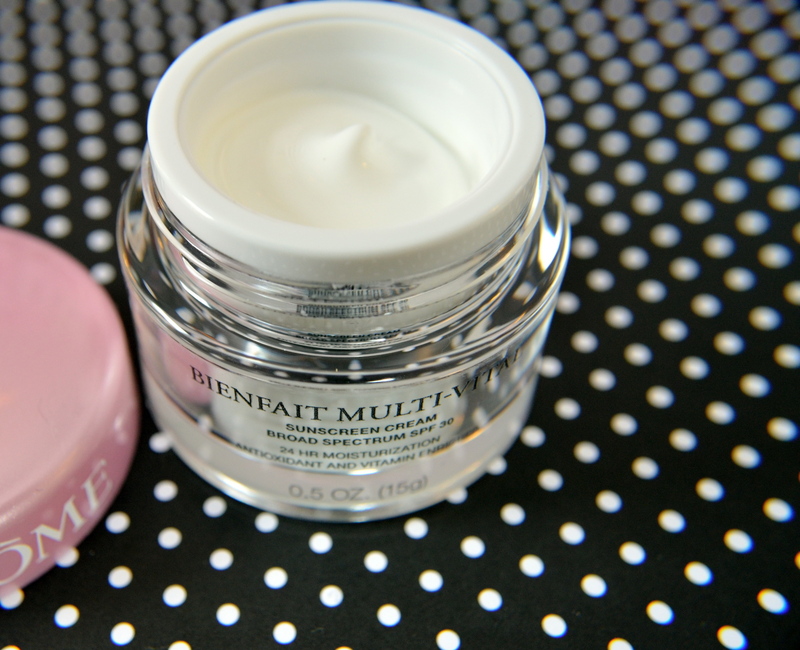 With 30 SPF, you can’t go wrong with this indulgent moisturizer. Although I’m partial to LUSH products, I’ve been using this in the morning before I put on the LA Base Pro Primer. The sample came with a lot of product and it didn’t feel too heavy on my skin. It smelled really fresh. I still prefer my LUSH moisturizer called Celestial. This gloss was underwhelming. Nothing too great. Just a simple lip gloss. It has little color payoff and a lot of shimmer. Although this girl loves glitter, the product just wasn’t something I got too excited about. I did, however, put some on when heading to the church for my sister’s wedding (before I did my makeup). I really love the packaging and the application wand is nice. The smell reminds me of chemicals. 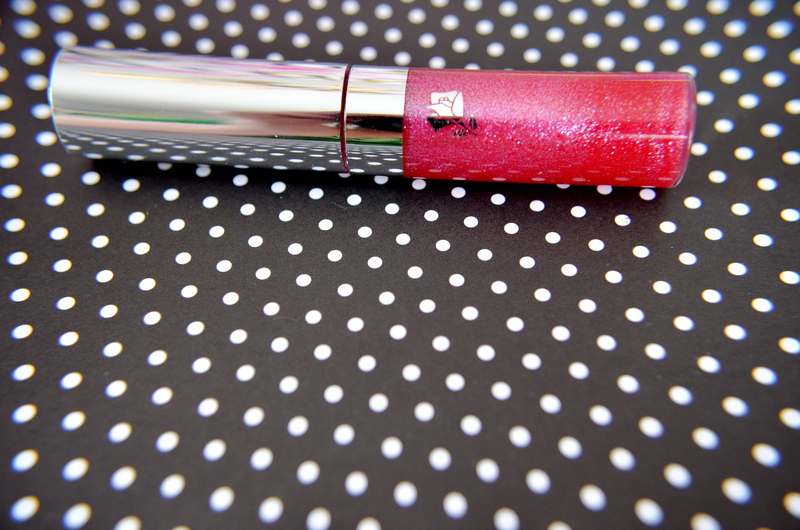 If you like lip shimmer that’s a little pigmented, this may be your go-to “no makeup “makeup gloss. 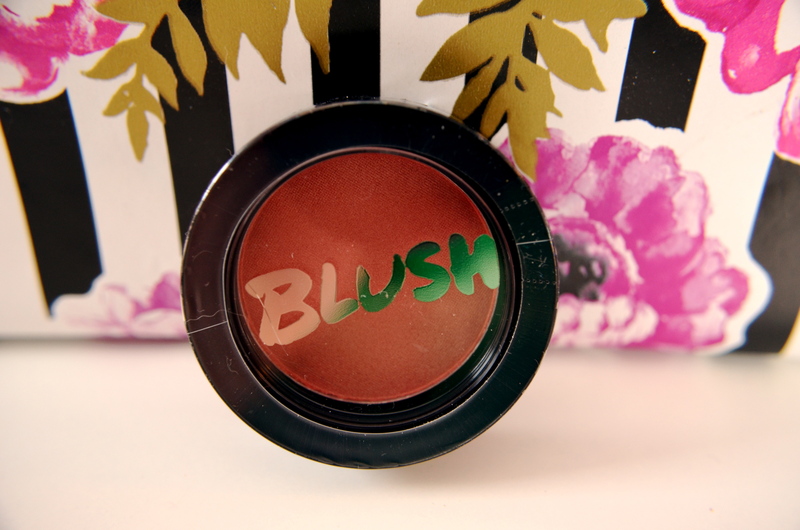 This blush rocks. 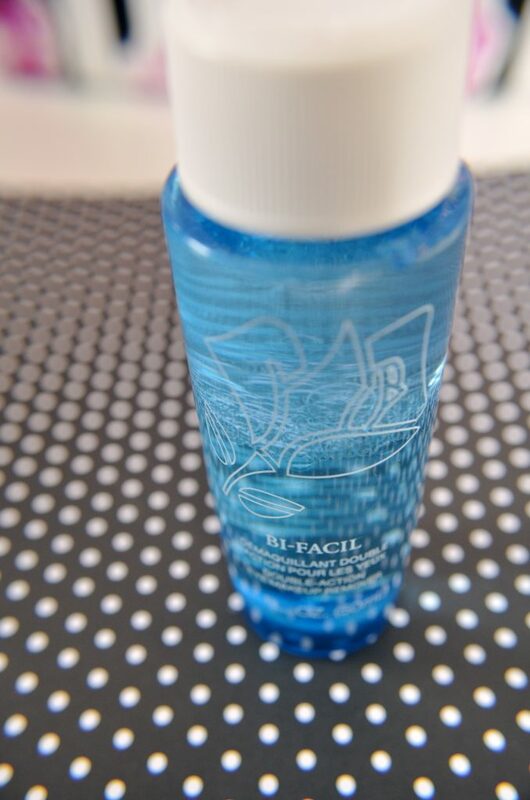 The packaging is really nice and I like the mirror which makes for easy application. 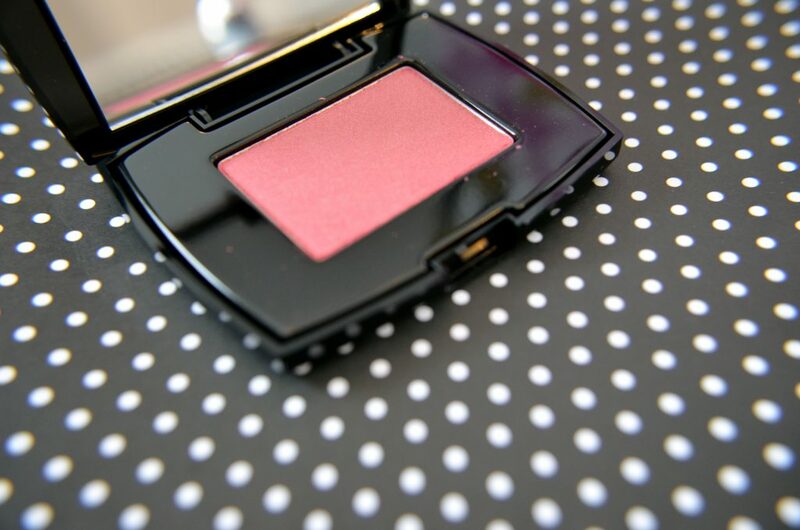 Blush Subtil is oil-free and is a powder blush. 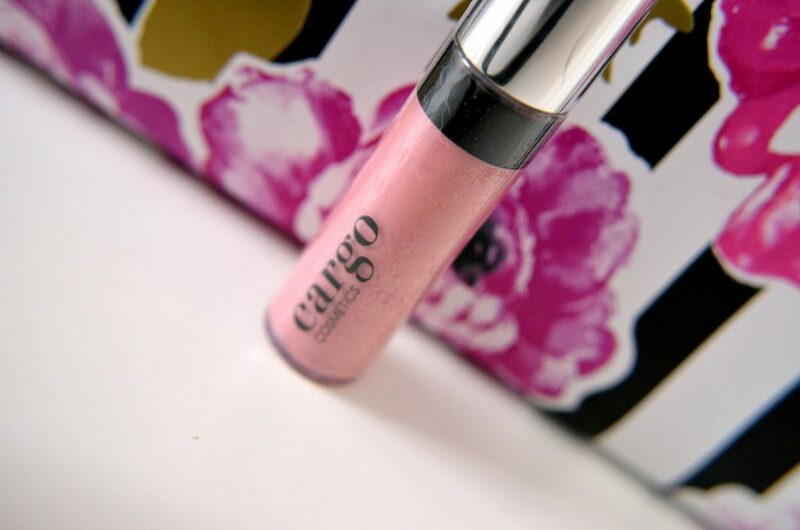 The shimmer is the right amount and the color is a pretty pink – perfect for my skin tone! I don’t go through blushes too quickly so I think this will last me a long time. 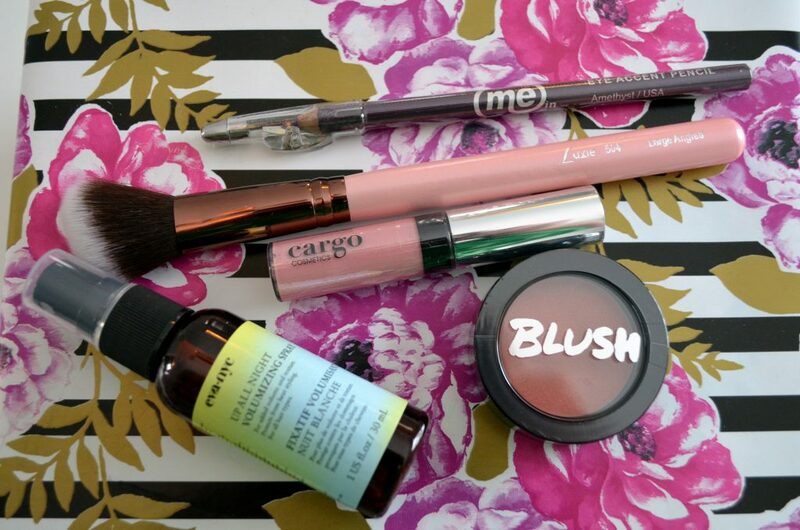 I like applying it with a peachy lipgloss and light eye makeup for a “fresh-face” look. Overall: It was a pricy investment. I do love picking up products that I know will last me a long time and will help my makeup stay on longer. Honestly, I wouldn’t have purchased the LA Base Pro if it hadn’t been for the bonus items and my sisters’ upcoming wedding. (They get you with those bonuses!) I’m pleased with the product but I’m not sure how other brands would compare since I’ve never purchased a full-sized face primer. I’ve used samples of Smashbox’s Photo Finish Primer and Benefit’s Porefessional. They seem to be similar in quality but I can’t make a right assessment since I didn’t wear them as often. There’s just something about getting a little gift in the mail every month. When I was a little girl, I would run out to the mail to check if I had received letters or packages. One of my fondest mail memories was opening a package sent from Santa Claus that had a bunch of stationary and coloring pages. Years later, I’m still fascinated by snail mail and the new movement of “happy mail.” A way I indulge this little desire to receive a doorstep package every month is by subscribing to different subscription services. 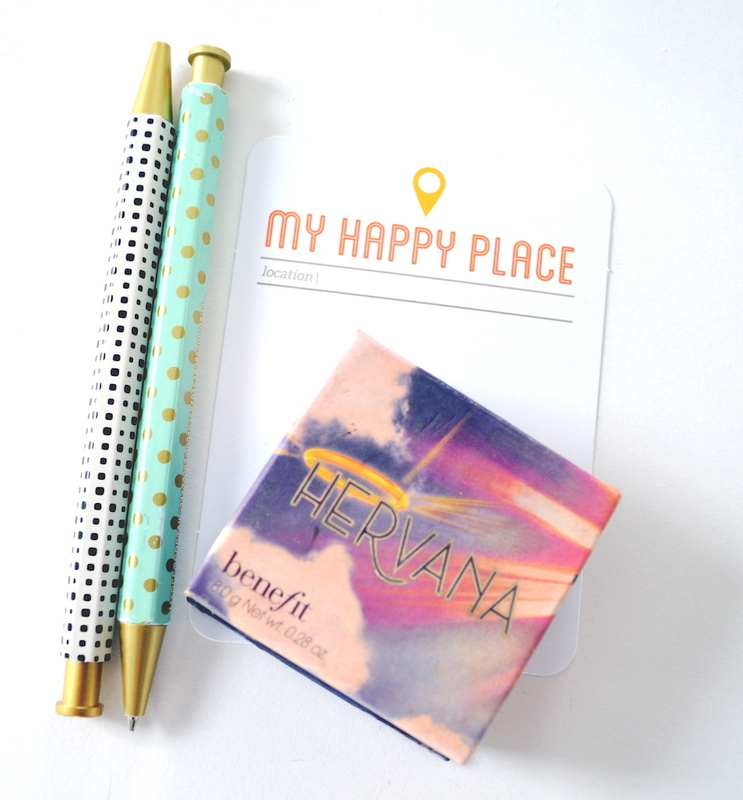 Ipsy is an online beauty community created by Youtube star and makeup artist Michelle Phan. In addition to offering videos and creative beauty content, the site’s main attraction is the monthly Glam Bag. For $10, you can receive a curated makeup bag filled with goodies that are put together especially for you! Now, I know $10 can be a stretch for something a little extra, but I’ve noticed I purchase much less makeup and beauty products since receiving this monthly goodie (ask my husband)! Also, the products are great quality and add up to much more than $10. Here’s what I received for the month of February! 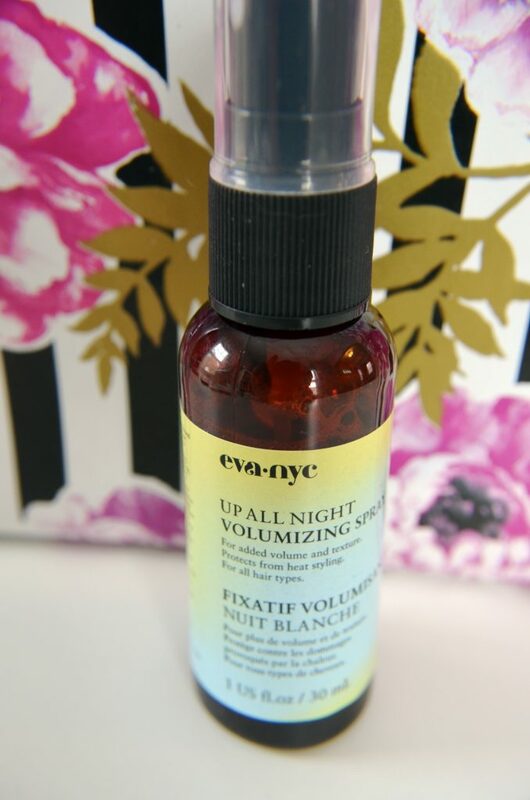 I tried the Up All Night Volumizing Spray on damp hair and allowed it to air-dry. The product is designed for blow-outs but I noticed it gave me more volume even though I didn’t hit my hair with my blow dryer! The smell is deliciously fresh. I really appreciate the fact you can use it to protect your hair from heating tools. This face brush by Luxie Beauty has the same quality as (gasp) my Sephora brushes! The bristles are extra soft and create the perfect blush application. I really like the wide handle and have used it for both bronzer and the blush which was included in the bag. I’m glad the product is cruelty-free and would purchase more brushes from Luxie Beauty. I think this is the very first blush/face brush I’ve received in the two years I’ve been a subscriber. I really like that they included a blush and brush to go together for this look. As much as I love the color pink, I don’t do light pink lipglosses. I tried this sample and liked the color payoff but not the color. It went on smooth and stayed on, but wasn’t for me. I’d love to try another shade! When I saw this blush, I thought it looked too pigmented to create a more natural look. I was wrong! I used the included Luxie brush and lightly tapped it on my cheeks. After blending it out, I had created a natural looking pink flush! I have NARS Organism and love it but it has a lot of shimmer. This is a more peachy color and doesn’t have much shimmer. For my sister’s wedding makeup, I added some and then used NARS Laguna bronzer underneath. It looked beautiful! Note to self: don’t write a product off just because the packaging or by first impression! I’m glancing down at my hand and can still see a trace from the eyeliner that I used when doing my sister’s makeup yesterday. The liner that was included in February’s Ipsy bag has been my jam! I’m not a huge fan of purple liners and usually wear my go-to Kat Von D Tattoo black liner but this stuff is great. The product glides on smooth and stays put. The color is a deep purple that looks really great with cool shadow colors. I had never heard of Pencil Me In Cosmetics and wasn’t sure about them until I tried the liner. On further inspection, I learned the brand has been featured in some notable magazines like Women’s Day and Seventeen and it’s made without harmful petroleum and parabens (win-win)! Pencil Me In Cosmetics offers thirty different colors in their liners and they’re about $7 each. 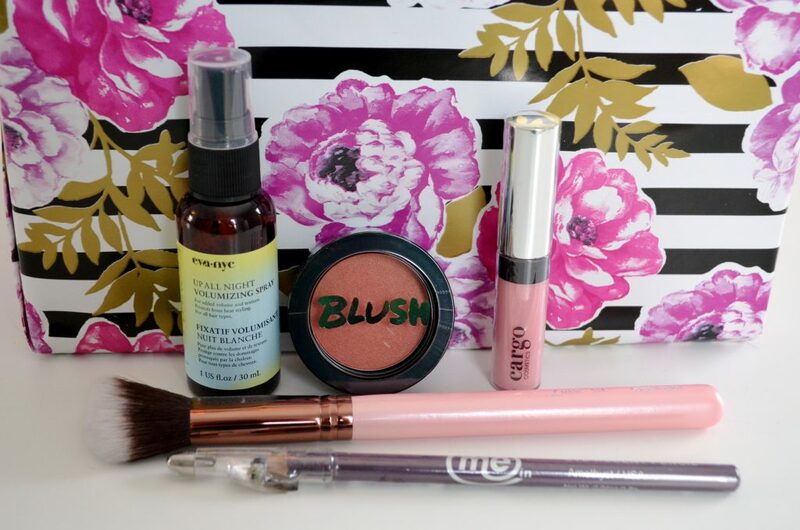 This is one of main reasons why I adore Ipsy – I love trying new products and learning about new brands! I would’ve never even thought to try this kind of liner and am surprised at the quality and color payoff. Overall: I loved this months bag! 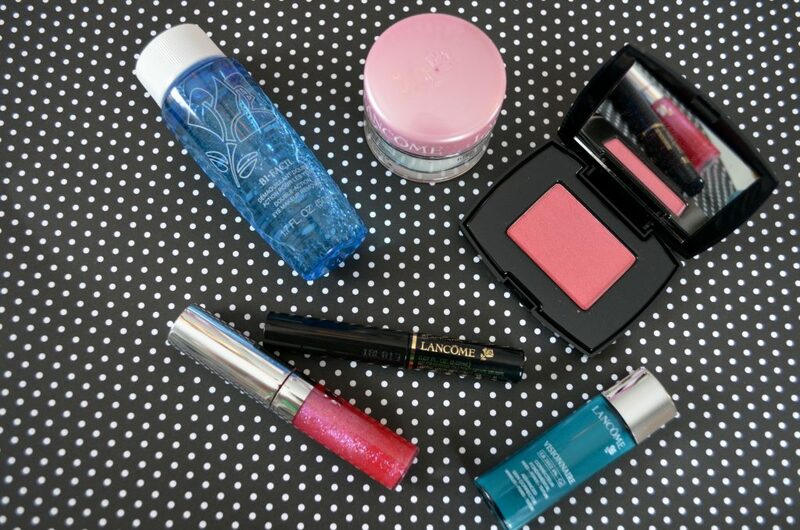 The total products were totaled at about $57 and it included a cute pink cosmetics bag. For $10, I was really impressed and will use the majority of the items. My favorite was the liner and Luxie brush! If you’d like to sign up for Ipsy, visit them online here. *Ipsy is purchased by yours truly. I’ve included my affiliate link to Ipsy so that I can receive points if you chose to sign up. Poeticlaughter. What You’re In For. Perhaps I’ve become a world-wide-web phenomenon and I’m working with Sephora and Taylor Swift is my bestie and calls me when her cats aren’t getting along. Or… you may have just stumbled upon this itty bitty section of the internet by accident or by looking up information about T-swift’s cats. However you got here: I hope we can become fast friends and you’ll want to click around and stay awhile. Poeticlaughter is a blog dedicated to life and beauty through the lens of love. The journey to begin this blog is a long one with many attempts and failures. I remember when I lived in Chicago (in 2010) and worked in an office. I hated it. I lacked creativity and was sick of getting everyone’s mail everyday. Deep inside I knew I had more to offer the world and that I just needed the right push. I have something unique to offer. There aren’t many beauty and lifestyle blogs that follow the latest trends but with an uplifting, empowering believers perspective. So what does Poeticlaughter mean? It means that there is beauty and poetry in our life and laughter. It means that you can laugh at yourself and embrace your unique God-given talents in a way that doesn’t make others feel less-than. It means that whether you’re in your teens or are navigating retirement you can be beautiful inside and out while leaving your own mark on the world. On poeticlaughter.com I’ll be your guide, blogging about the latest in makeup, home decor, relationships and life! Although my primary focus will be on beauty, you may see glimpses of my personal life. I’m learning to love myself well and the world around me one day at a time. Join me and learn a thing or two about lipstick, the latest in skincare, and if that hyped-up mascara is really worth $24. Oh, and there may be a few posts about cats.